2019 Oberlin Holiday Bazaar Vendor Information - Nov 17, 2019 - OBP : CHAMBER : Positively Oberlin! 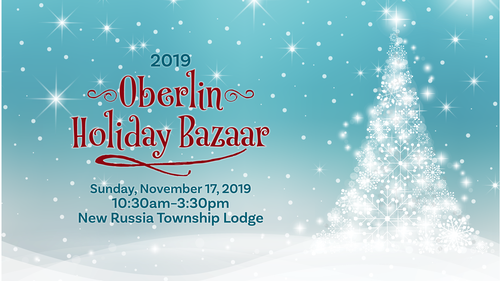 If you would like to participate as a vendor in the 2019 Oberlin Holiday Bazaar, please click on "Register" and fill in the contact information. You will be sent information about the event and how to apply as a vendor. If you you are a returing vendor, please acknowledge that on the application. The New Russia Township Lodge is perfect for the Oberlin Holiday Bazaar, there is plenty of parking and enough space for 70-75 vendors. Vendor set-up begins at 8:30 a.m. and tear-down starts after 3 p.m.